Thankfully, we only have one generation per year, so caterpillars won't appear until next spring. If you experienced high gypsy moth populations this year including defoliation and are considering making an application to the Ohio Department of Agriculture (ODA) for the 2019 Suppression Program, now is the time to begin. Applications must be completed by September 1 for consideration for next year's program. 1) The proposed spray block must be located in a county that has been designated quarantine for gypsy moth by ODA. Areas of isolated infestations outside the quarantine counties fall under the Slow the Spread Program of the USDA, Forest Service, and are subject to their criteria and funding limitations. A quarantine map can be found on the ODA website. 2) The proposed spray block must contain a minimum of 50 contiguous forested acres. Adjacent property owners and housing developments should combine their acreage to meet the 50 acre area requirement and to obtain maximum benefit from the treatment. 3) The proposed spray block must have a concentration of at least 250 egg masses per acre in residential areas. Forested areas must have a minimum of 1000 egg masses per acre. ODA field staff will confirm this. Do not remove current season egg masses until you have been notified that ODA surveys have been completed. 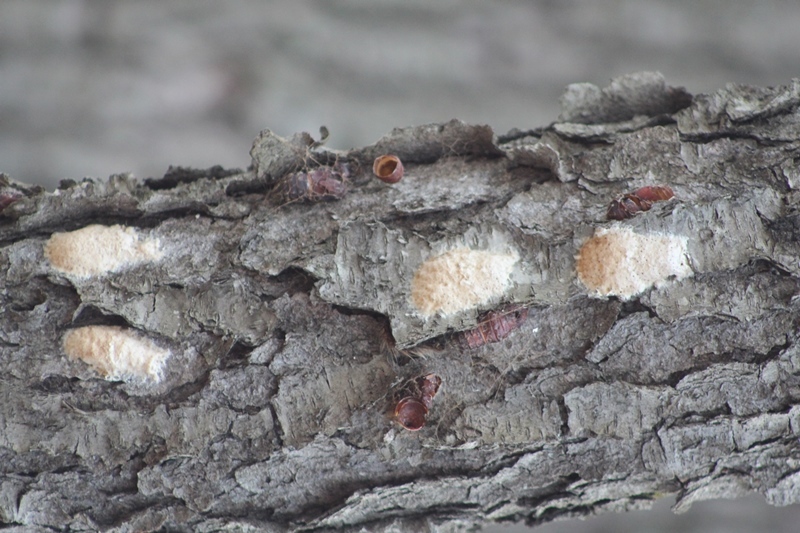 While egg masses are commonly laid on the trunk or branches of trees, that can be laid nearly everywhere. The photo below shows two egg masses laid on a piece of outdoor wooden furniture. I have observed egg masses laid on homes, sheds, in birdhouses, under decorative art pieces in the landscape, on firewood and on vehicles and trailers. 4) The proposed spray block must have a tree canopy that covers no less than 50% of the block. 5) The proposed spray block must consist of at least 35% of tree species that are either susceptible or resistant to the gypsy moth. 6) The proposed spray block must receive a favorable Threatened & Endangered Assessment from the Ohio Department of Natural Resources and the United States Fish & Wildlife Service. There is a local cost share involved if the area qualifies and is explained on the ODA website. The payment is due prior to the treatment next year. There is no cost to complete the application to determine if the area meets the above qualifications. If you have any questions, additional details including the actual application is available on the ODA website.